Claim Your FREE Gift Now and Become a Profit Insider™! Click To Claim Your $293 Gift! I’m a former multi-location, multi-doctor practice owner of 15 years (yet, I’m not a dentist) and since 1996, through my company, Jerry Jones Direct (JJD) my team and I have trained and coached thousands of dentists to help them build their ideal lifestyle while increasing their net income. In fact, it’s the exact opposite. You see, I’m prepared to make a $293 investment in you. Right now. I believe so deeply in what we do here at JJD and the results we're able to achieve for our Members, that I’ll write a check to get this free gift in your hands! at no charge or obligation to you, EVER! Who's this free gift for? Dentists, ONLY, who are sick and tired of all the lies, misdirection, subterfuge and unrelenting sales pitches with no concern about you, your goals or what you even want? “Success merchants” running big ads in the big trade journals (you know who), etc. …it has become nearly impossible to discern what truths exist and actually work to grow a practice! I get it. I saw it daily during my time as a practice owner, and frankly, it’s a shame – disgusting even. And, like you, I get the very same journals and nonsensical emails, and appeals from needy dental consultants, coaches and so-called “experts” desperate for your money. So, Doctor…I’m prepared to make a $293 investment in you. Are you prepared to receive it? End the madness – and get CLEAR on what you really want from life and your practice! To claim your $293 gift, free, simply subscribe now and become, at no charge, a Jerry Jones Direct (JJD) Profit Insider™! All About Your FREE $293 Gift! 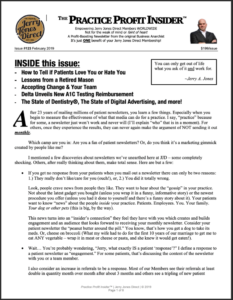 Just for taking action now, you’ll receive a hard copy of Jerry’s latest $199/issue Members’-Only Monthly Newsletter, The Practice Profit Insider™. How to improve your leaderships skills, and much more! ACT NOW and you’ll also receive, as a free welcome gift to Jerry’s Daily Email, his newest and most invaluable report he’s ever written, Profit Insight®, where inside, he reveals the BIGGEST discovery he’s ever made in marketing – the secret to attracting all the new patients you could ever imagine based on his 20+ years’ experience in practice marketing and coaching, and, 15 years of owning his own “from-scratch” practice he sold in 2018 for a huge profit! information and we will rush this out to you today! 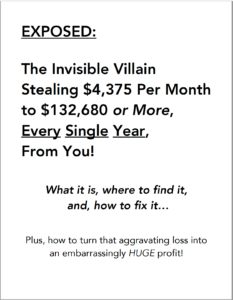 Wondering if Jerry's Daily Email Profit Insiders™ is for you? **UNSUBSCRIBE AT ANY TIME. You may unsubscribe at any time and Jerry’s $293 FREE GIFT is yours to keep. This is a one-shot chance to join Jerry’s elite practitioners of success…once you get on this daily email list, and you later decide to unsubscribe, you will be blocked and unable to subscribe in the future. 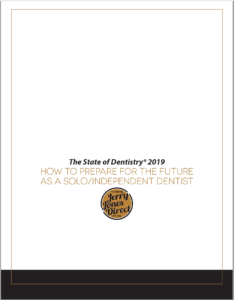 This is truly a one-time opportunity, specifically for dentists who want to grow their practice and increase their top (production) and bottom (net profit) lines.